The Winter 2010 issue of our campus newsletter, Skidaway Campus Notes, is available on-line here. 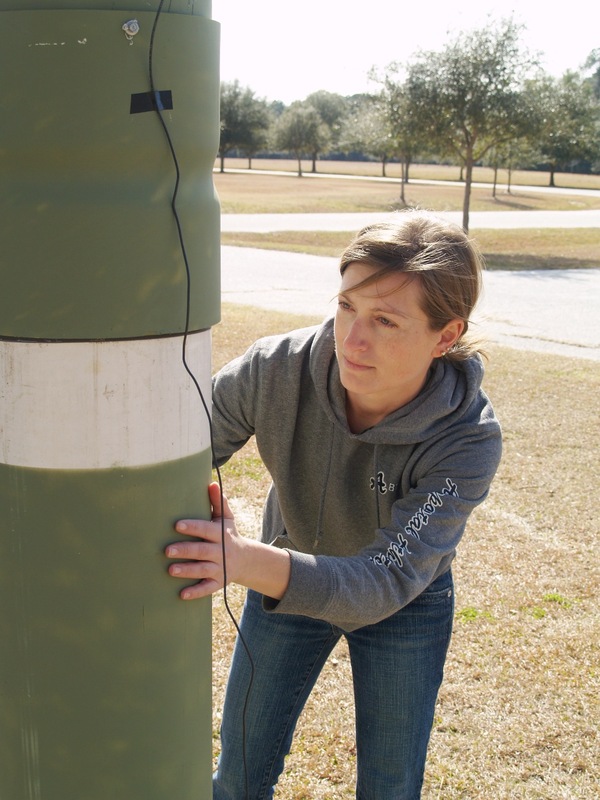 The Skidaway Institute of Oceanography is expanding its coastal radar system with the addition of a new send-receive station on Jekyll Island. The radar system, called WERA, is used to study surface ocean currents on Georgia’s continental shelf and out as far as the Gulf Stream. Research coordinator Trent Moore works on a radar antenna in the dunes on Jekyll Island. The Jekyll Island unit is the third station in the system. Two original stations were installed on Pritchard Island, S.C. and on a coastal island south of Savannah. The three systems work together to create a detailed map of surface ocean currents across an area stretching more than 125 miles off shore from South Carolina to North Florida. The map consists of hundreds of data points on the ocean surface which are updated twice an hour. The map shows the speed and direction of the surface current at each of those points. The equipment was purchased with a grant from the Georgia Research Alliance, combined with funding allocated by South East Atlantic Coastal Ocean Observing System. “Measurement of surface currents and waves has a broad range of economic, societal, research and educational applications,” said Skidaway Institute professor Dana Savidge. Those include search and rescue operations; tracking and predicting the trajectories of oil spills and pollutants; maritime operations; commercial and recreational fishing and boating; ecosystem assessment; and improving our understanding of the response of the coastal ocean circulation to major winter storms or hurricanes. Aside from the practical applications, Savidge says the primary purpose of the system is to improve researchers’ understanding of what is happening on Georgia’s continental shelf. The new site will significantly increase Savidge’s ability to study eddies that develop at the juncture of the shelf edge and the Gulf Stream. These eddies may affect the supply of nutrients available to marine life in that area of the ocean. The radar data can been seen as a map, with the color, length and direction of the arrows showing the velocity of the surface currents. The orange and yellow arrows on the bottom right indicate the Gulf Stream. There are presently approximately 100 similar radars operating throughout United States. The installation on Jekyll Island will greatly increase coverage to include the entire Georgia shelf and northern Florida. It will add critical overlapping redundancy with existing installations, providing essential two-installation operation during periods when one installation of the three may go down due to lightening strikes, power outages or other problems. 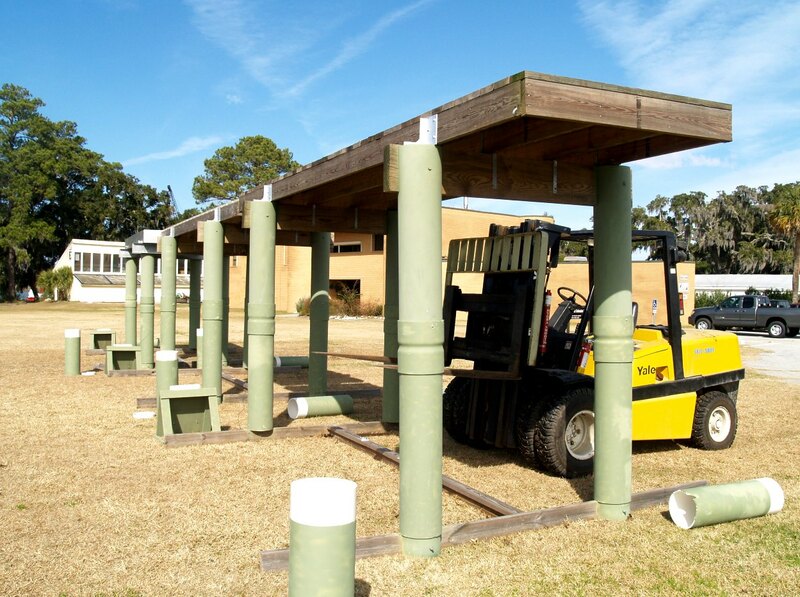 The new radar system is located at the Villas by the Sea condominiums on the north end of Jekyll Island. 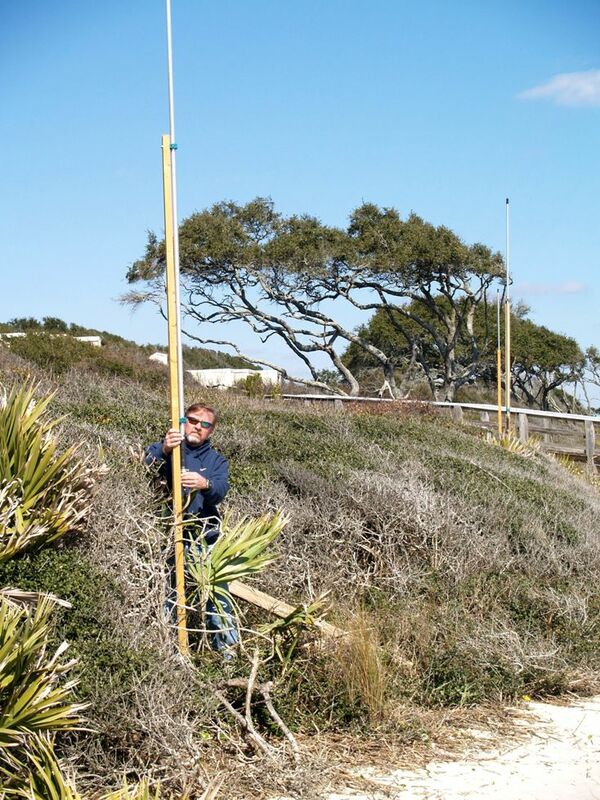 “We can’t say enough about how great the folks at Villas by the Sea have been to work with us on this and allow us to install our antennas there,” said Savidge. 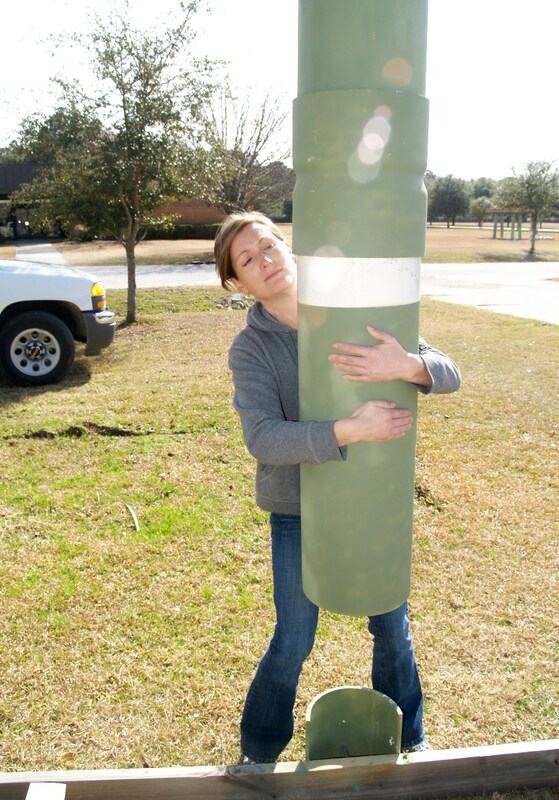 Savidge also praised research coordinator Trent Moore who she said, “has shouldered a very long term commitment and wrestled this thing through multiple stages, none of which are shy of endless details and physical efforts.” Skidaway staffers Jay Fripp and Harry Carter also contributed to the project. Data from the radar system can be seen at the Skidaway Institute Web site. We will begin a project to thin out the forest on our campus later this year. The Skidaway Institute campus consists of approximately 700 acres of mostly wooded land on the north end of Skidaway Island. Sometime over the next several months, we expect the thinning project to get underway. This will not be a “clear cutting project.” We are just thinning out the forest to promote the healthy growth of the remaining trees. Crews will thin the woods by cutting every fifth row of the stand as well as any adjacent malformed or out of place trees. The project will involve the woods on both sides of McWhorter Road, from just north of the triangle at OSCA Road to the developed portion of the Skidaway campus. We are very fortunate to have such a beautiful piece of property here, and we try to maintain it as a natural laboratory. As a coastally-located oceanographic institute, we are very sensitive to environmental considerations. We will be using state-of-the-art practices which will ensure that the thinning operations have minimal impact on the surrounding forest, and we will be especially careful to ensure that operations don’t affect our nearby marshes and tidal creeks. We look at this as necessary maintenance to keep the forest strong and healthy. We don’t expect this project to seriously inconvenience our neighbors here on Skidaway Island. However, residents and visitors will probably notice the log trucks traveling up and down McWhorter Road. In addition, it will be necessary to limit public access to much of the forested portions of the Skidaway campus during operations. The tree thinning project is being managed by the Georgia Forestry Commission. We expect to finalize a contract with tree contractor by mid-April. The actual thinning will probably begin later in the year. For additional information, anyone can call Mike Sullivan at (912) 598-2325 or email mike.sullivan@skio.usg.edu. Check out our on-campus newsletter! We produce a monthly (mostly) newsletter that is intended for our campus community. From time to time it has some interesting tid-bits. You can check it out here. Our campus “mock docks” grew a little taller today. The purpose behind this project is to measure the effects different dock designs have on the underlying salt marsh. Earlier research indicated that the shadow cast by docks have a negative effect on the plant growth in the marsh surface in the dock’s “footprint.” Recently, dock designers have developed new designs and materials to help alleviate this problem. The questions are – do they work and how well? 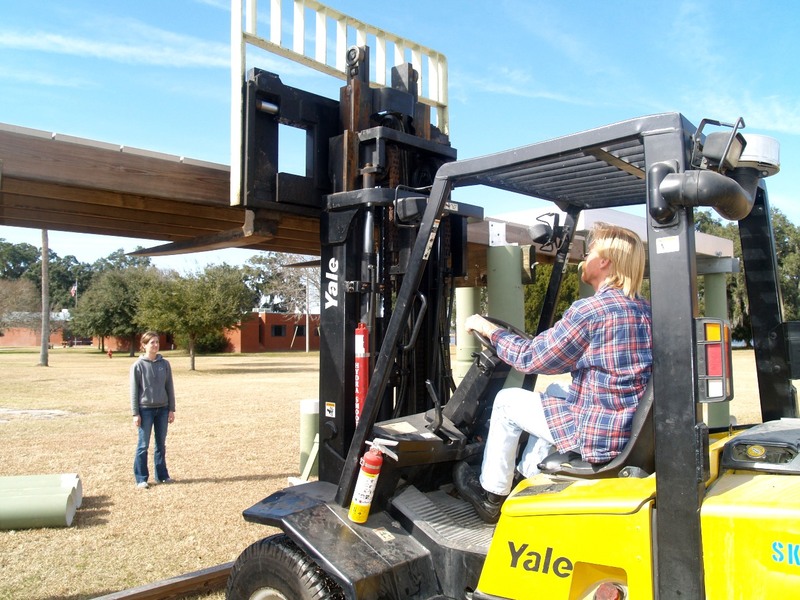 As a part of this project, a Skidaway Institute team headed by professor Clark Alexander built a four “mock docks” on our campus. One is constructed with traditional material and in a traditional design. The remaining three are of different design and materials. The docks are equipped with light meters to measure the light difference between the top of the dock and the footprint below. Over the past year or so, they have been adjusted to various orientations to capture the sun and shadow at different points of the compass and throughout the year. The next step is to obtain data for docks at varying heights. Harry raises the platform with the fork lift as Lee Ann watches. This afternoon research assistant Lee Ann DeLeo and fork-lift driver Harry Carter raised the existing dock models roughly two feet. Lee Ann removes an old, shorter leg. They lifted the deck structure off their bottom legs and replaced the legs with slightly longer ones. Lee Ann checks the fit as the platform structure is lowered onto the new leg.